Koreatown is a beautiful cookbook that gives us an inside look at Korean-American food in this country. Deuki Hong and Matt Rodbard are the voices behind this energizing perspective. Deuki Hong is chef of Kang Ho Dong Baekjeong, Korean Barbeque and Matt Rodbard is a food and music writer and a contributing editor at Food Republic. This book is meant to educate home cooks of all backgrounds about Korean-American food, beyond what is mainstream today. The book begins with a section on ingredients and equipment needed. The next chapter is Kimchi and Banchan, banchan translated means “small plates and side dishes”. Here the side dishes are meant to complement the main dish. There is the expected chapter on rice, noodles and dumplings which was great too, but the barbecue, grilled, smoked and fired was my favorite, very interesting. Love the read on gas vs. charcoal. The book ends with Sweets and Desserts, which showcases a handful of delicious baked items and a recipe for Toasted Rice Ice Cream. Check out this book if you have a chance, it's a real gem. From the chapter Kimchi and Banchan I prepared the Sigeumchi Muchin, Soy and Sesame Spinach; muchin translated means “mix with seasonings”. This recipe uses a great technique of blanching spinach in boiling water for 30 seconds, then immediately toss greens in an ice water bath, drain well, set aside. When ready to serve toss spinach with soy sauce, sesame oil, a little sugar, pepper and garlic. Enjoy! Hi Tandy, will share a kimchi recipe in a week or day, this book has some amazing quick kimchis. I have never actually had Korean food before, but it is something I am going to have to try this year. Hi Dannii, it's pretty new to me as well, loving the food, amazing stuff. 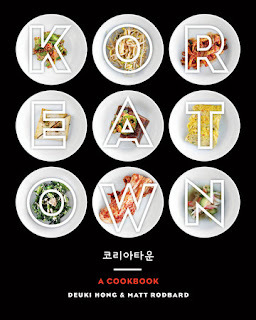 I really would love to pick up this book, I know next to nothing abut Korean food! Thanks Sue, sounds like we are in the same boat, very interested in some of the recipes, will be giving them a try. Hi Vidya, I am wanting to learn more, can't wait to try more of the recipes. Thanks Kushi, have some recipes lined up, will post. I have many ethnic cookbooks in my cookbook collection, Cheri but, I don't have a really good Korean cookbook. I must put this book on my wishlist ASAP! Hi Louise, will have to try the soy sauce on mushrooms, thanks for another great tip, sounds delicious! Thanks Louise, will give it a try, love mushrooms! I have never made a Korean recipe but I do love their foods. The spinach sounds delicious with those added spices. I love that we can learn so much about foods from other countries and cultures. Looking forward to more Korean dishes from you. Have a great weekend, Cheri! Hi Robyn, Korean food is fairly new to me, when I google Korean restaurants around us they are mostly Korean and Japanese. Very interested in trying more dishes. Dear Cheri, I do not have a Korean cookbook either but a friend of mine holds Korean cooking classes - utterly delicious fare! I would love to take a closer look at this cookbook, it sounds very interesting! Another book worth buying and adding to the ever growing cookbook collection. Hi Andrea, yes, it does seem like the "collection" keeps getting bigger and more varied, love it. The soy and sesame spinach (served with soy sauce) is right off a Japanese menu =) (And the prep method, too.) I am intrigued and am hankering now to get my hands on the cookbook to make some of those described desserts!